At a time when things are looking dire for Christians in the Middle East, they have acquired an articulate new spokesman who is also relatively young by the standards of clerical greybeards. 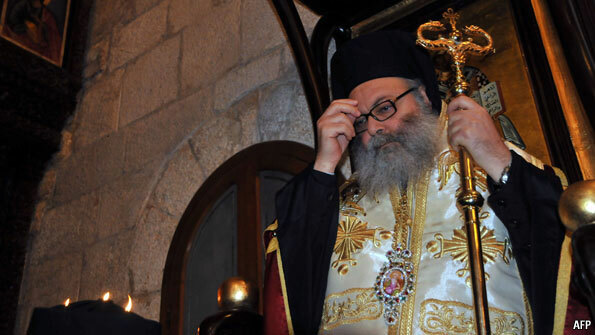 At a gathering in Lebanon on Monday, the Orthodox Christians bishops with jurisdiction over Syria, Lebanon and much of the Arab Christian diaspora made a surprise decision to bestow on John Yazigi, who is currently serving as an archbishop in Paris, the ancient title of Patriarch of Antioch. The newly elevated prelate was born in 1955; his predecessor, who died earlier this month, came into the world in 1920. Although it is said in the Bible to be the first place where the word “Christian” was used, these days Antioch—the Turkish city of Antakya—boasts few Christian residents. So the patriarch has in recent centuries resided in Damascus, which was a relatively comfortable place for Christians until the current civil war broke out. Since then at least 100,000 Syrian Christians have fled their homes. Several claimants to the ancient see of Antioch, each representing slightly different denominations, reside in Damascus; but it is the newly elected one who will take his place alongside the Ecumenical Patriarch (based in Istanbul) and Patriarch Kirill of Moscow as co-leader of the world’s Orthodox Christians. While many of the top jobs in Middle Eastern Orthodoxy are still reserved for Greeks, the newly-filled patriarchate of Antioch has been in local Arab hands since the end of the 19th century. Since then it has always had close relations with co-religionists in Russia. The new Patriarch speaks English and French well and is comfortable at international conferences. In his Parisian post Mr Yazigi was responsible for many converts to Orthodox Christianity. But he is in no danger of losing touch with his hard-pressed heartland. His brother is Orthodox bishop of Aleppo, where an ancient Christian community has seen many of its churches and neighbourhoods targeted, and is living in terror of the possibility that a jihadist faction of the opposition will prevail and try to cleanse the city of all those who are not Sunni Muslim.